>>>I wish the Ides would have played a few more songs, but there was no disappointment in the rest of the show. I cannot give enough credit to Jim Peterik and his whole behind the scenes crew who put on another outstanding show. Just when you thought he could not put out another great show - HE DOES! I already am looking forward to next year’s show. I thought you said or I read that there would be a CD coming out of this years show. I sure hope so. You can get more Ides music in the not-too-distant future, however … besides the new CD they’re working on, they’re also back at The City Winery on March 6th, right before they take off for a week of cruisin’ on The Flower Power Cruise, sharing the stage with such rock and roll luminaries as The Beach Boys, Tommy James & The Shondells, Blood, Sweat & Tears, Jefferson Starship, The Lovin’ Spoonful, The Yardbirds, Cheech & Chong, Gary Puckett and The Union Gap, Big Brother & The Holding Company, Chuck Negron formerly of Three Dog Night, The Family Stone, , Melanie, The Cowsills, The Box Tops and more, all hosted by Peter Asher! However, Jim DID tell us about another new release he’s working on that’ll feature some past World Stage live performances. I’ve been putting the final touches on my World Stage Album to come out on April 26th worldwide on Frontiers. Guests read like a who’s who of classic rock: Dennis DeYoung, Kevin Cronin, a previously unreleased track by Jimi Jamison, Kelly Keagy, Jason Scheff, Kevin Chalfant, Toby Hitchcock, Work Of Art, Danny Vaughn of Tyketto, Gunnar and Matthew Nelson and the amazing Mike Reno. This album Rocks. We are also in the middle of recording the Ides of March 55th anniversary album, Play On! The Ides chose the great Fred Mollin (Jimmy Web, America, Johnny Mathis) to produce. Guest stars so far include Bo Bice of American Idol Fame, Mark Farner, Cathy Richardson, Joe Bonamsssa and more to come. Look for a May / June release on this one. On a semi-related note, it was just announced that .38 Special will return to The Arcada Theatre on June 20th. Tickets are available now. Scott May has been with the Ides since they reformed in 1990 ... 28 years. Great stuff on World Stage. Are you going to see The Ides at City Winery? A friend of mine used to say that he would not go to see a group unless it featured the original lead singer. He did not care about the other musicians in the band. He just wanted to hear the voice from his radio memories. If it was a solo act, this was not a problem. I have found that many people don't care. A lot of folks have purchased those crappy greatest hits cds that feature 'new stereo recordings featuring one or more of the original artists'. They just wanted to hear the tunes and did not care that they were not the original versions. I made my New Year’s resolution to be more tolerant of traveling oldies talent a while back. You may never hear a 60’s / 70's cover band play Baby Hold On, Temptation Eyes or The Runway, but you CAN hear those songs played live by the current Grass Roots. We advertised a show featuring the Little River Band a couple of years back. 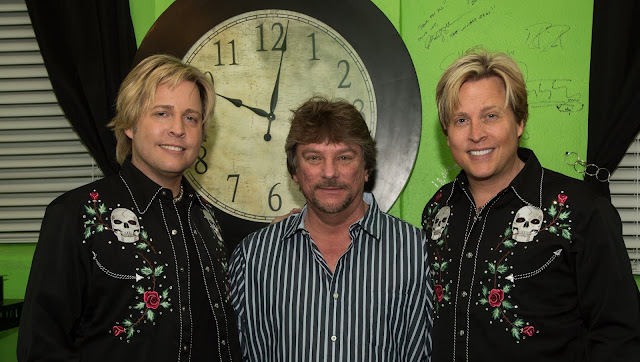 I interviewed lead singer Wayne Nelson and we talked about the fact that there were no original members. He has been a member since the early 80's and did sing on three of my favorite LRB recordings: Night Owls, Take It Easy On Me and The Other Guy. They had a great crowd for the show and the arrangements and vocals were true to the originals. The concert fans either did not know or did not care about the band’s history or current lineup. They just wanted to hear the music from their youth played live. I was one of those purists who wouldn’t go and see a band unless it was something approximating the original group. I suppose I’ve altered my thinking now. Let’s face it - Father Time is undefeated. The hitmaking groups from the 60’s and 70’s are now IN their 60’s, 70’s or even 80’s. If the originals give their blessing to a new crop of folks playing the hits under that band name while staying faithful to the original sound (and those points are made VERY clear to the ticket buyer up front), that’s good enough! The best example I can think of would be the Oak Ridge Boys, who started out singing gospel music ... in 1943! The guys with the secular hits like “Elvira,” etc. didn’t become part of the Oaks until 20 or 30 years afterward. The name has endured, only the lineup has changed. Ownership of the band name - now that becomes another story. I think it’s a big tougher when the key member of the band who wrote and sang ALL of the band’s hits leaves and then the band tries to carry on without them. In these situations, I’ll spend my money to go see Burton Cummings, John Fogerty and David Pack rather than the groups out there now touring as The Guess Who, Creedence Clearwater Revisited and Ambrosia. I agree with points made by both readers above … I want to hear these songs the way they sounded when they first became hits. Loved the “Eli’s Coming” video clip … what a great find! It certainly breaks down the song according to vocals. Now here’s a PERFECT example I can use about “false advertising” by bands still trying to connect to their audience … and I didn’t even think of this one until I saw Shelley’s email. How ridiculous was it for Danny Hutton and Cory Wells to continue as Three Dog Night when there were only two of them??? Well, pretty ridiculous … but not NEARLY as ridiculous as Danny Hutton continuing to use the name after Cory’s passing with one more single singer who had nothing to do whatsoever with the original band or its success! Now THAT would be a band I could not endorse seeing … Three Dog Night, starring Danny Hutton along with somebody you’ve never even heard of. I was reading your blog today and saw what Shelley Tufano posted about the Nelsons show. I actually have two shows with them in Ohio in September … September 6th in Findlay, Ohio, at the Marathon Center for Performing Arts and September 7th in Lorain, Ohio, at the Lorain Palace. 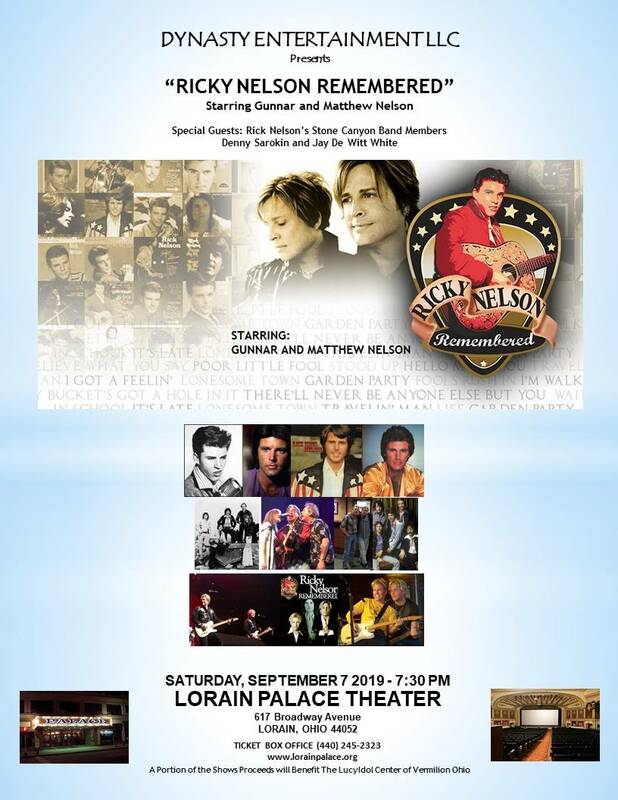 The shows in Ohio will feature living members of the Stone Canyon Band who were with Rick almost 10 years … including Denny Sarokin, Jay White and Ty Grimes. These guys rocked … and the Nelson Twins really enjoyed jamming with them live on stage. 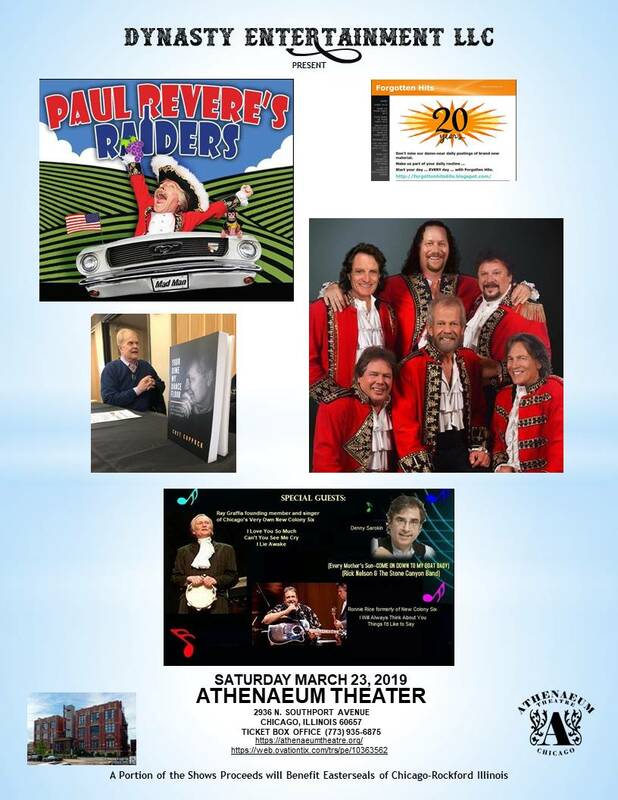 For the show I put together at the Athenaeum Theater, featuring Paul Revere’s Raiders, Ronnie Rice and Ray Graffia, Jr., both one-time members of The New Colony Six, and Denny Sarokin, formerly of Every Mother’s Son and Rick Nelson’s Stone Canyon Band, I have added some additional Special Guests ... Chet Coppock, Kent Kotal of Forgotten Hits and Bruce Mattey will join me for this great fundraiser for Easter Seals! The Mike and Micky Show is ready to head back out on the road. Michael Nesmith (and his First National Band) kicked off shows this past Thursday Night (January 17th) in Seattle, WA … but come March (March Madness Indeed!) they’ll team up together again for a series of shows that will take them all over the place for the next several months. 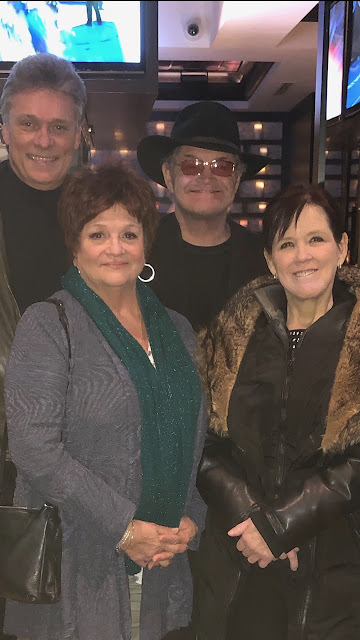 Speaking of The Monkees, Micky was just in Canada this past week for a three show stand at The Avalon Theatre (at Fallsview Casino) in Ontario. While he was there, he found time to do a guest spot on The Peet and Reet Show, on Tri-Stream Entertainment, with radio’s Pete Dychtiar and Rita Carrey. They also celebrated Rita’s brother Jim’s birthday at Ruth’s Christ Steak House in Ontario. I read in yesterday's newspaper that there will be two 50th Anniversary Woodstock Concerts at the same time. One will be at the original site and one close by. And, if a 60th Anniversary isn’t big news enough for you, how about the launch of the 100th Anniversary campaign launched by Capitol Records to celebrate the birth of Nat King Cole!!! With the direct participation of the Nat King Cole Estate, and as part of the celebration of the global entertainment legend’s centennial year, Capitol / UMe will release two new collections showcasing Cole’s music on March 15: Ultimate Nat King Cole (CD and digital; 2LP vinyl to follow June 14) and International Nat King Cole (CD). The former includes an exclusive new duet of “The Girl From Ipanema,” pairing Cole’s original vocals with newly recorded vocals by GRAMMY®-winning Blue Note Records artist Gregory Porter, whose much lauded 2018 album tribute to Cole, Nat King Cole and Me, is GRAMMY-nominated this year. On the same date, a newly expanded edition of Marvin Gaye’s 1965 album, A Tribute To The Great Nat King Cole, will be released by Motown/UMe for download purchase and streaming. The releases are among a host of special events, projects and programs commemorating the 100th anniversary of the birth of Nat King Cole, widely acknowledged as one of the most honored and iconic performing and recording artists of all time. Born March 17, 1919 in Montgomery, Alabama, the masterful pianist and vocalist’s initial focus was the jazz idiom, having formed the Nat King Cole Trio while in his 20s. The group was an almost immediate sensation and proved influential to the extent that no less an authority than Count Basie marveled, “Those cats used to read each other’s mind -- it was unbelievable.” Ray Charles inducted Cole into the Rock and Roll Hall of Fame in 2000 and readily admitted to Cole’s monumental influence on him. International Nat King Cole is exclusively available for preorder from uDiscoverMusic.com. The limited-edition CD presents 14 beguiling songs Cole recorded in languages other than English at Capitol Studios in August 1964, including “L-O-V-E” in French, German, Japanese, Spanish, and Italian; “Muetterlein” (“Answer Me, My Love”) in German; and “Autumn Leaves” in French and Japanese. Ultimate Nat King Cole and International Nat King Cole both include newly-written essays by actor and award-winning writer James Ritz. Nat King Cole’s huge influence is evident in the new expanded edition of Marvin Gaye’s A Tribute To The Great Nat King Cole. In addition to album’s original mono mix, which is making its digital debut, the new edition features more than a dozen bonus tracks, including six alternate takes from the studio sessions. Along with his trailblazing musical career, Cole is recognized for his contributions to the struggle for civil rights and racial equality. His efforts were done in his own unique style. In 1946, Cole broadcast a 15-minute national radio program, “King Cole Trio Time,” the first of its kind to be hosted by an African American musician. In 1956, he also became the first major African American entertainer to host his own national network TV show. NBC’s “Nat King Cole Show” aired weekly from November 1956 to December 1957, the cancelation of which was caused by a paucity of sponsors since marketers were afraid to offend white viewers with a program hosted by an African American. Cole also appeared in several films, including his top-billed portrayal of W.C. Handy in 1958’s St. Louis Blues and his final big screen star turn as Shouter / Sunrise Kid in 1965’s Cat Ballou. In 1948, Cole purchased a house for his family in the all-white Hancock Park neighborhood of Los Angeles. The Ku Klux Klan burned a cross on the family’s front lawn, and members of the neighborhood’s property owners association told Cole they did not want any "undesirables" moving into the neighborhood. Cole responded, "Neither do I. And if I see anybody undesirable coming in here, I'll be the first to complain." He helped overturn the 1920s Los Angeles statute that had kept the neighborhood segregated. The KKK targeted Cole and struck again in 1956 when Klansmen rushed the stage and beat Cole at a concert performance in Birmingham, Alabama. He would never perform in the south again. In 1959, Cole won the GRAMMY Award for Best Performance by a "Top 40" Artist for “Midnight Flyer.” In 1963, he was honored with a Special Achievement Award from the Golden Globes. In 1990, Cole was posthumously awarded the Recording Academy Lifetime Achievement Award. He has four recordings in the GRAMMY Hall Of Fame: "The Christmas Song" (1946), "Nature Boy" (1948), "Mona Lisa" (1950), and "Unforgettable" (1951). Cole’s 1944 hit, “Straighten Up And Fly Right,” and the Jazz at the Philharmonic album series in which he is a featured artist have been selected for preservation by the Library of Congress’ National Recording Registry, which honors "culturally, historically, or aesthetically significant" American recordings. In 1991, Cole’s daughter Natalie Cole released Unforgettable: With Love, featuring her virtual duet of “Unforgettable” with her father. The album topped charts around the world and won the coveted Album Of The Year GRAMMY Award. Just three years thereafter, the U.S. Postal Service issued a Nat King Cole commemorative stamp in its "Legends of American Music" series. In 2000, Nat King Cole was inducted into the Rock and Roll Hall of Fame. Established in 2008 by his twin daughters Timolin and Casey Cole, Nat King Cole Generation Hope honors the legacy of their father and mother, Maria Cole. The 501(c)(3) organization dedicates their resources to build sustainable music programs for schools across the United States. Interest in Nat King Cole’s story continues to grow as each new generation discovers his music, as well as his trailblazing, catalytic role in several important cultural and sociopolitical advancements, including the U.S. civil rights movement. The arc of Cole’s life is a study in success despite adversity, and the triumph of civility, respect and talent married with political, cultural and business savvy. This weekend on Saturday, January 19th, from 11 am – 1 pm Eastern, Michael Shelley welcomes three authors to discuss their recent books: Harvey Kubernik on "The Story Of The Band," Ian Rusten on "The Rolling Stones in Concert, 1962-1982: A Show-by-Show History," and Tom Smucker on "Why the Beach Boys Matter" … with lots of related music! Here's a clip I recently pulled from our radio tapes in Dodge City. Note concerts from the Fugs, Spirit (yet to have a big hit) AND TRAVIS PIKE TEA PARTY!!! It's WBZ Boston from 1-20-1968! 51 years ago THIS WEEK!!! Also, I think I've sent this before, but this is a wonderful site on the BOSSTOWN sound. It is indeed the Elegants. I actually had the answer before you went to press … but decided to wait for the confirmation anyways. Unlike various news sources, I wait for a positive confirmation. PS - You didn't mention that David Cunningham, lead singer of the Floaters, has floated on to his next life. He was 65. Hmm ... I hadn’t heard about that one. Hey, didn’t Cheech and Chong do a parody of this song, too? While the band’s music was a cherished secret of record collectors for many years, the music is now available to be heard by everyone, which has ushered in a new fourth generation of fans around the world, who hear the Watchband sound as it has reverberated into the psyche of the class of 2018 psychedelic bands. I am a bit worried about stealing too much space in FH lately, but this is really time sensitive stuff for me and FH, so I figured I'd put it together and send out to you to post. As you know, I am VERY passionate towards my 60's radio love from my childhood … and these are just further illustrations of that fact. The winter of ’68 / ‘69 was possibly the period when me and my brother Steve were most prolific at AM radio DX'ing and recording on reel to reel. As I did previously for 1967, I have put together a montage of what radio sounded like from November, 1968 to February, 1969, growing up in Dodge City, Kansas DX'ing the great AM radio stations and great tunes and DJ's of that winter. If you wish to download, do so at the below site. It is 34 minutes and this time, guaranteed that every piece is from my brother Steve and my recordings made as it happened. Most of the music is edited to show how we spun the dial endlessly looking for that great tune or DJ. You'll even hear then-current Beatles song rendition hits by Arthur Conley, Wilson Pickett and Joe Cocker! A couple of the clips have been featured in FH previously. WARNING: This montage is filled with good and bad quality recordings featuring speed and volume variation, AM static and fading, dropouts, distortion and TV interference common to AM long distance listening. This is NOT for the "Reel Radio" site perfect aircheck listener. That said, sit back and relive top 40 radio 50 years ago this month. I’ve listed a little more info below. The file is 31 mb and lasts 34 minutes. MUSIC: RNB, "flower child music," ELVIS comeback, oldies (souvenir weekends), folk, pop, rock, soul, bubblegum, psychedelic, foreign language and more -- some songs, you'll even hear TWICE. IF you thought "Beatlemania" ended with 1964, think again. The "White Album" (or as our FH star Chuck Buell correctly calls "The Beatles") is very prevalent in this tape including some confusing November, 1968 pre-release airings of "Hey Bulldog" and "You're Too Much" (released in February ‘69 as "It's All Too Much") giving the Besch brothers a four month exclusive before it finally showed on the "Yellow Sub" album. Chuck Buell even joins in on a song! You'll get "exclusives" and premiers like Joe South's new song being glorified on KIMN Denver. It would win the Grammy for "Song of the Year." JINGLES: Those great radio jingles always made us sing them back to the radio we were listening to. Some sound a bit dated at times even for 1969, such as a KIMN and WNOE one. Some enhance the station greatly, IMO. FH ARTISTS: I'm hearing Ron Dante, the Royal Guardsmen, Tony Hatch (song), the Lettermen and lots of Tommy James, including his first self-produced 45 in hearing the B side, a great newly echoed 45 "Gingerbread Man" mix from the previous album! Chicago-wise, you'll hear the American Breed and NC6 TWICE and mention of the Joe Kelley Blue Band! KIMN - Denver, who Chuck Buell had left less than a year before for the Big 89, WLS. WNOE - New Orleans, who is still sticking with the echoes DJ sound of early 60's AM radio. WOAI - San Antonio, whose "Legendary" Larry Kent lets the White Album track run a bit long lending to the opening piano notes of "Don't Pass Me By" being heard! WABC - New York City. It was a great thrill when we were able to pull in the Number One Top 40 station in the nation and you will hear how hard it was to receive this long distance station. 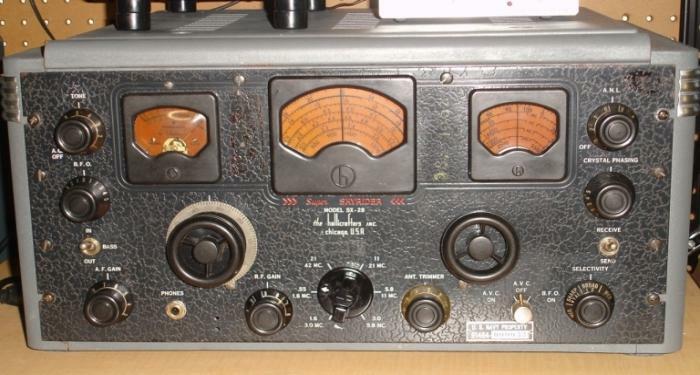 FEATURES: Do you remember all those things radio gave us back then? Here, you'll relive things like box tops mail ins, school closings, events emceed by the jocks, high school homecomings, football and basketball, upcoming concerts, the weather, countdown shows, "3rd of 8 in a row" and other BOSS radio-type format comments, cash calls, "Win a Mink!," spelling bees, movie ads, a Coke commercial featuring Ray and Aretha. How about an ad for learning computers in 1969 by graduating from a four year computer training college. This ad was on KIMN in Denver and the college was in Delaware!! Quite a musical ad it is, too. I checked into this and I found some people DID graduate in four years from this school! On a local slant in Chicago, many of us remember all the T-A-C-K-L-E acne commercials that aired in the 60's nationally, but by ‘69, the women's movement is forefront in the new ads! Who knew?? How about the annual Goldblatt's year end record sale with 45's for 49 cents and MONO LPs at $1.49? There's an ad for WLS' FIRST bridal fair. An ad for WCFL's new "Big 10 Summer Gold" various hits album and Ron Riley gives a long car ad for Mr. Norm's. Some great cars in THIS ad!! There's a WCFL plug about playing the second Blood, Sweat & Tears album in its entirety soon, also. DJ's: The DJ's in this piece are some of the most awesome I ever had the pleasure to hear. Luckily, I have been able to talk with or communicate with several of them, making for a great time for ME! Some of the DJ's heard or mentioned include Steve Brant, Charlie Greer, Chuck Dunaway, Larry Kent, Jim Clark, Bobby Shannon, Don Kelly, Scotty Winter and Fred Winston (when at WKYC before venturing to WLS stardom years later). Oh yeah, there LOTS of clips of fave Chicago DJ's from the giants, WLS and WCFL. You'll note in listening that WLS almost always sounded like a local, while WCFL was a distant attempt. STILL, these great competing jocks were ALL great in their own ways. Ron Riley and Larry Lujack are my two all time fave DJ's and it's sometimes hard to believe they were only on the same WLS staff for a year and a half. There's no way to describe Larry, as he changed with the times while on WLS and WCFL each for two different eras. He was simply great. Ron had the best radio voice and delivery I have ever known. He was full of energy and it just flowed out of the speaker into your ears. Oddly enough, Ron was often up against another Ron … Ron Britain blasted the airwaves from WCFL in the 6-9 PM slot for years as America's "First Psycho-delic Disc Johnny!" With constant drop-ins and a humor that was unmatched, you really had to LISTEN close to catch what was going on. I have been friends with both Rons over the years and it's been great knowing both. By late 1968, Ron RILEY had moved to late night on WLS and in early 1969 moved over to ‘CFL with Clark Weber. I was friends with Barney Pip before his death many years ago and you'll hear the DJ shift switches at 9 PM and at midnight on ‘CFL as the shows transition from Britain to Pip to Jerry G Bishop. Of course, Jerry was also the original "Svengoolie." In the clip you'll hear, Jerry chastises Barney for not saying goodbye and finally quips, "Oh well, they all look the same." What a great time for radio in the Windy City! You'll also hear clips featuring the "young new guys" at the Big 89 in 1968/9: Jerry Kaye and some guy named Chuck Buell. I gotta say that Jerry had a smooth late night style and Chuck identified with every youth who listened, LIKE ME! The ending clips are the close of a Chuck Buell show and Barney Pip's Christmas night show of 1968. BTW: You'll hear 9 of the top 10 songs on FH's recent January 6, 1969 Hit Parade and 27 of the top 40 hits on that chart! You'll hear WKYC agreeing with the Big 89, that the #1 song is "I'm Gonna Make You Love Me." Hope you enjoy it! We used our dad's 1940 Hallicrafter receiver (below) with all kinds of gadgets like tuning (big left knob) and "FINE TUNING (right big knob), fine or broad band settings, tone control. LOTS of things not available to most people recording off radio then. The reel to reel recorder was the Bell one below. The left "handle" was speed setting. When I was low on reel space, I could switch between 7 1/2 all the way to 1 7/8 changing available space and cutting sound quality. The right one was the one I waited with hand ready to throw it the second the promised new Beatles tune was starting or all the other recordings as well. The red button, one had to push down at same time as the play arm I just spoke of. Doing both was TRULY a pain on the thumb, as the record button pushed very hard. Our dad attached a swinging arm that would hold the record button down so all we kids had to do was fling the play arm into motion and we were on our way to recording AM glory. The lower left lights lit the thing up like Christmas! The yellow came on when we powered it up and the red when recording and the white one varied in lighting to show when your level was too high or low. On the right, you could plug in one or two mics or the radio direct! The 2 round buttons were fast forward and fast reverse. That helped when I was in a hurry to record over something that I quickly deemed as not "save-able." 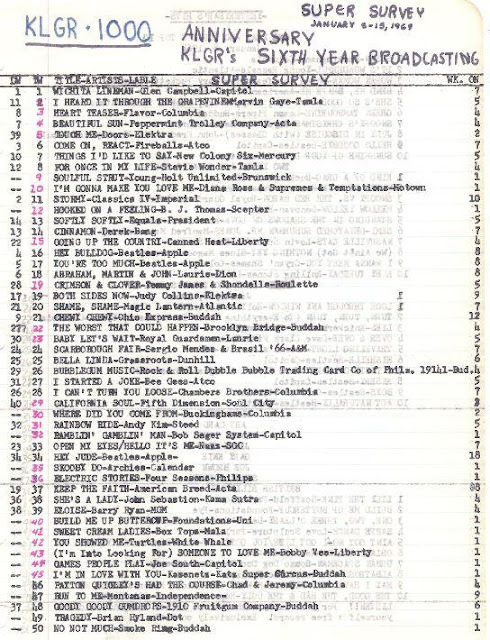 In comparison to FH's January 6, 1969 WLS chart, I'll offer MY pretend radio KLGR chart from same week. 23 of my top 30 tunes can be heard in the montage, so the reel to reel recordings were QUITE important to me. We were now getting free DJ 45 copies form our Dodge City country radio station, allowing for many songs to chart that got little airplay like #3, 4, 13, 30 and 46. On the back side of this chart, I listed the top 10 songs for that week in previous year on my charts. The January 8, 1967 and 1968 charts had #1's by the Buckinghams, so it was good to see them charting in ‘69 with their new 45 at 30. This year would begin my transition from MONO AM to STEREO FM listening and in mid-June, I would start listing (with *) the songs "heard in stereo on KLGR." >>>You may have featured this film from years past, but here’s a look at 1968 at the Big 89 with John Rook running things. This film makes WLS sound like an MOR station to my ears … what do you think??? I have a reel of the original 16mm film version of this, marked “WLS". Any idea what I could do with this? I ran into Mario Novelli at a dinner function the other night and he told me about his band’s new single, “River Grove” … which just happens to be the village where he and I first met some thirty years ago. IT’S MORE FUN WHEN YOU’RE YOUNG????? I also trust people over 30. Frank also sent us this clip from The British version of The Voice … where skiffle great Lonnie Donegan’s son was a contestant. I had NO idea that Lonnie had a hand in writing Tom’s big 1969 hit “I’ll Never Fall In Love Again” … but Tom was so moved, he sang the song with him. And all these stations that pride themselves on presenting the “No Repeat Workday,” guaranteeing that you will not hear the same song twice between 9 am and 5 pm … allowing the listener to leave the station tuned in for their entire work day. I just know that secretly after the promo runs and the next record starts, the people at the station are whispering “But you WILL hear all of these same songs tomorrow between 9 and 5 … and the day after that … and the day after that … and the day after that (and sometimes even in the same order!) … and the day after that … etc., etc., etc. 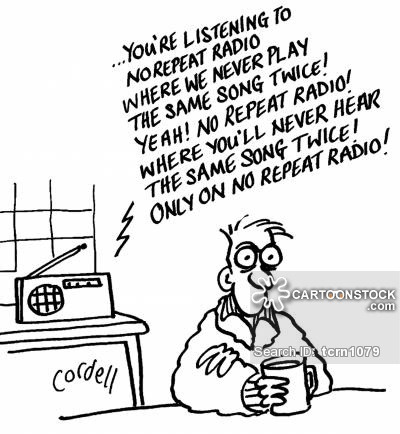 Just beef up the play lists so you don’t have to torture the listeners or the people working at the station with the same old same old, day in and day out, day after day after day. Give the listener a reason to tune in every day … and they will! Let’s put an end to the current mind set of “short attention span radio” where, now thanks to computerized automation, much of the same deejay patter is ALSO repeated a couple more times throughout the day because the geniuses that program this stuff figure that there is NO WAY the guy listening at 7:30 on his way to work is still listening at 7 PM that night. Don’t sell yourself short … give us a reason to listen, and we’ll stay tuned in.